This neat set of three ceramic tea light holders would make a decorative addition to your home, or as a welcome gift. Our tea light holders come in a selection of colours - here you can see them in the paler tones of beige, green and white. 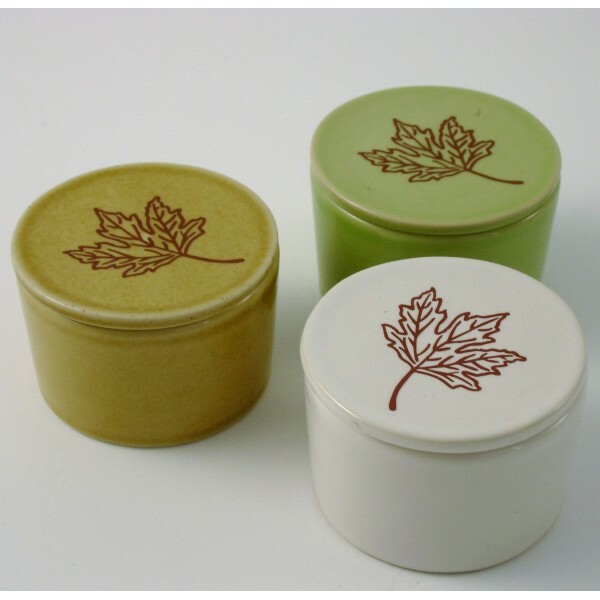 The pretty chocolate coloured maple leaf pattern decorates their lids which also double as an extra base, and an incense stick holder using the tiny punched hole underneath. Sold in sets of 3 in the same colour choice. Size: 4cms high x 6cms across. Colours: Beige, pale Green, White. Also Brown, deep Chocolate and Black available.